Lewisburg is a beautiful, authentic community nestled between the picturesque Susquehanna River and Bucknell University. Lewisburg's heart resides in its charming downtown. The downtown commercial district and adjacent neighborhoods are listed on the National Register of Historic Places. Rich in culture, the arts, and steeped in history, Lewisburg invites visitors to stroll tree-lined, lamp-lit streets, browse distinctive shops, dine in one of the many friendly restaurants, or stay overnight in a comfortable bed and breakfast. Discover Lewisburg's historic downtown with a stroll along Market Street. This charming small town center offers more than 40 retail stores, friendly restaurants and coffee houses, museums, galleries, live music, and many events set amongst tree-lined streets dotted with historic street lamps and architecture. This 22-acre multi-generational park offers activities for all ages, including a skate park, multiple playgrounds, a community pool with water slides, and a Life Trail for older adults. Lewisburg is a beautiful town with a victorian charm whose downtown commercial district and adjacent neighborhoods are listed on the National Register of Historic Places. Visitors are invited to tour the town on foot to enjoy the pleasant streets and historic architecture. 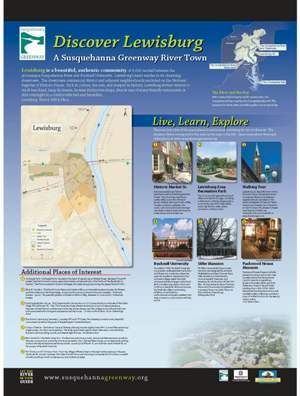 Self-guided tour maps are available on the Lewisburg, PA website. Founded in 1846, Bucknell University is a premier undergraduate institution and liberal arts university where the personal academic experience of an intimate college meets the wide choices available at larger institutions. With a student population of around 3,500 on a beautiful, 450-acre campus, Bucknell also offers outstanding athletics, art exhibitions, performances and guest speakers that help connect our community with the world. Eli Slifer's remarkable Tuscan-style mansion was designed by eminent Philadelphia architect Samuel Sloan. Slifer served as State Senator, Commonwealth Treasurer, and Secretary for the duration of the Civil War. During the early days of the war, the country home was completed on a property known as Delta Place, on the outskirts of Lewisburg. Packwood House Museum initially served as a tavern and inn for river travelers along the Pennsylvania Canal's crosscut at Lewisburg. Museum founders in Edith and John Fetherston lived in the old hotel building from 1936-1970s. Edith frequented local estate auctions and traveled widely, collecting an eclectic array of artifacts which can be seen by visitors today.